"I hear young people of all ages saying they never really thought they could make any of their dreams come true" says 24-year-old multi-lingual charity founder, award-winning novelist, RJ Tolson...."But I'm here to tell you, where there is inspiration there's a way." At only 17 years of age and while still attending high school, RJ Tolson began posting chapters to his Chaos Chronicles Book 1: Zephyr The West Wind, an adventure filled extravaganza of superheroes, mythology, magical realism, paranormal power and creatures, to Wattpad.com, a youtube equivalent for writers. Tolson's fan base grew rapidly to many thousands. In less than a year Universal Kingdom Print signed the 18-year-old college freshman to a five book Chaos Chronicles Series with Zephyr The West Wind the first in the installment. Zephyr The West Wind garnered RJ Tolson a Finalist Award in the 2013 Beverly Hills Book Awards and National Indie Excellence Book Awards. At that same time and only 19-years-old, Tolson launched a National Literacy Campaign. Traveling from New England to Florida and across the West, he urged middle and high schoolers to forge excel chiefly through the skills of reading and writing. This movement became the impetus for Tolson’s self-help book, Project Limitless Vol I: The Success Initiative. Tolson's creative talents don’t stop with literary works or business. He is a musician, lyricist and composer and cites legendary composer and conductor, John Williams, and Williams' award-winning compositions as an inspiration for his Zephyr The West Wind Original Book Soundtrack. 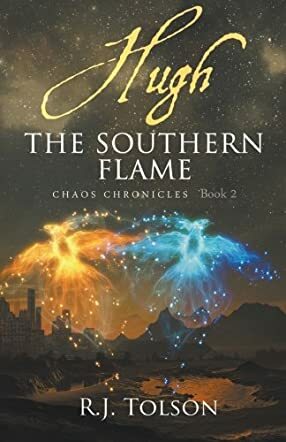 Hugh the Southern Flame by R.J. Tolson is the second book in the young adult fantasy series, Chaos Chronicles. In the world of Evos, the Nios Crystal is said to be the most powerful weapon of all since it granted control over fear itself. Espers are people with supernatural powers who are ranked on five levels, based on their power and ability to control it. Burst City is the most technologically advanced settlement in this world and its prosperity is assured by the agents. These are highly powerful people who go on missions into the dangerous lands beyond the walls of Burst and who make sure their city stays on top of the others. Aodhfin, the most powerful of the Burst agents, managed to find the Nios Crystal, but lost it and he was banished for this terrible mistake. Presently, Hugh, Aodhfin's seventeen-year-old son, an untrained, level one pyrokinesis Esper who discovered his abilities while being bullied at the orphanage, is sent into Burst City to study. Having lived all his life in his father’s shadow and been abused for his predecessor’s failures, Hugh is delighted to learn that he had been selected to enter the three phased trial of becoming an agent of Burst. But, the reputation of the trial is fierce, having claimed lives in the past. To free himself from his father’s mistakes and find friendship, Hugh is willing to risk everything. The second book can be read without knowledge of the first volume; however, the latter’s readers will be delighted to see certain symbols and patterns repeat themselves as R.J. Tolson prepares the ground for the bigger picture - the four demigods chosen to stop Chaos. Hugh the Southern Flame is the tale of the second chosen one. Throughout the story, we follow Hugh’s point of view as he describes the places he visits, the wonders he witnesses, and gives rich details on his training and fighting. There isn’t any shocking violence, but there is a constant stress as the whole world seems to be against Hugh, and he struggles to find friends and the truth about himself and his father. Overall, I greatly enjoyed this novel from Chaos Chronicles and await its sequel. I would recommend it to readers who want a vivid taste of the warrior’s journey in conquering fear. It is an inner journey as much as it is an outer one. "This is a second part of a series. But it was refreshing in that it is not necessary to have read the first book to appreciate the story. It stands on its own quite well, and the ending leaves the reader wanting more. The pacing and plot are innovative, creative, and relentless, reminding one of a video game. The numerous scenes of battle, against foes of increasing strength and almost-supernatural power, are exciting page-turners. Hugh is an engaging character, and the other characters are vivid and believable. The book is designed to appeal to the younger generation of readers, and seems to fit the genre exceptionally well." I am in total awe at your talent! Your have accomplished so many amazing feats at such a young age! Your Zephyr:The West Wind was a great book! Talented writer is, yet, one more talent you possess! To top it all off, you are not arrogant nor boastful...Just confident, appreciative and amazing! RJ has a unique way of engaging the young reader in the adventures of Zephyr. Even those youth who normally shun books become excited by RJ's stories. I've watched RJ grow from a child to an amazing, talented young man. He uses his talents to inspire other young people and lift them up while entering them. He is giving back. He knows what is important and takes his talent as a gift. This book is awesome! I read this book in about three days and couldn't get enough of it! Can't wait for the next book! RJ has such a lithe literary mind, that one forgets the fictive elements of the text. That's how well developed RJ's writing style is. Bravo, Sir! I have been a fan for years. R.J. Tolson has great style, character development and an inspiring story line. I just purchased Hugh The Southern Flame and am enjoying it already. Thought Zephyr was the greatest and am pleased to have the latest book. You should hear his music sound track too. RJ Tolson's Chaos Chronicles Series is compelling. I'm just 90 pages shy of completing his 454 page Zephyr The West Wind and well into Hugh The Southern Flame. I'm enjoying both books! I initially started reading RJ Tolson's Chaos Chronicles Series in order to find a book or two as a Christmas gift for my pre-teen and teen nieces and nephews. These two books will definitely be in their Christmas stockings. I'm confident the adversity that the protagonists encounter and how they overcome it will inspire my young relatives and other young readers. My daughters like to read but it's been difficult to get them to read larger books. My friend told me about this series and I bought them each both the books in the series. They loved them! They can't wait for the next installment in this series! Congratulations RJ on your book reviews. Wishing you much success with your second book, Hugh The Southern Flame. Looking forward to you returning to CT to speak at my middle school about your National Literacy Campaign. Very impressive young author with a lot of potentional. Cannot wait for the next work. Congrats on the award! This is a fabulous book. I am so proud of RJ. I met this guy few years back and he suprises me every day with his focus , talent, knowledge and desire to help others as well. Good luck with the series! I'm inspired by how you published it at such a young age. I certainly will encourage my grandsons and others who I know love this genre to read your books. I applaud your efforts to encourage young people to read, since it is a wonderful way to learn. Enticing young readers today can be quite daunting today, especially with an ever-growing array of digital inhibitors. Yet, R.J. demonstrates impressive skills to be able to engage both young and mature/older readers alike. Keep honing that talent and those publications! !